Heat butter in a pan. Add vegetables to it and fry them until brown and soft. Add salt and sugar to the vegetables. Cook and stir till moisture evaporate from the vegetables. Take a bread slice and smear it with pizza sauce. Spread the vegetable mixture on the bread and garnish it with mozzarella cheese. Grill the bread in an oven or over tawa for 3-4 minutes, or till the bread is crispy and the cheese melts. 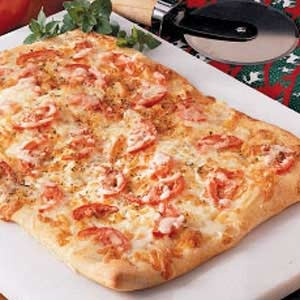 Fabulous Bread Pizza . I'm sure Kids will luv it . Thank U .
I expected more from this recipe since everyone had a great fight over it. No hard feeling but it was OK.And I wish that cool cook a punch on the nose. hey all, i just checked the recipe coz it appeared interesting..what is all this fighting goin on here...and whoz this cool cook? i could not find anyone posting any comment by this name...i guess it was removed by the admin people..anywaz i liked the recipe, its easy and looks scrumptuous! All you lucky guys..iv tried posting 2 recipes guess they ain't that good ..never got published...still showing in upcoming section ! im voting for this one! This recipe is owsom i will try it coolcook ko sirf doosro ki recipe mai buraai dhoondne aati hai khud to kuch paka nahi saktay isiliye. Thank you for supporing me friends i post receipe for working couples and bachlors who can prepare brakfast very quick so that they can save time. I will not post any more recipes on here until this hacking business stops. And Mr . Vinood is right you are a jealous person. Excuse me is this coolcook a hacker??????????? How can he sign in 4m my account and give comments, this is unbelievable. Can the Administarion people do something about this. Plz help. People are tryin 2 give me a bad name. I am shocked and disgusted.I vote 4 Mt Kumar. and trust me it is not me. I just signed in but I am truly sad to see grown up men fight like us kids. I though this place was for sharing recipes. I'm signing out. Thank you both of you. Its a great recipe (not only for the kids) Vinodkumar!.I vote for the recipe. HAHAHAAAAAAAA you made my day and made be laugh. Jealous ???????????? If I were posting recipes I would be jealous but I am frank and honest and many people don't like it here. Hello Mr Coolcook y r u Jealous of my recipe i have completed cooking course in bangalore i know how to prepare break fast please mind u r work mr cool cook and for u r information the recipe which i posted are prepared in my bakery and i sell nearly 50-60 pieces per day. Futur do not get jealous to smoeone recipe.